The MIC-8086 Development and Training System includes a target board based on the 16-bit 8086 microprocessor. 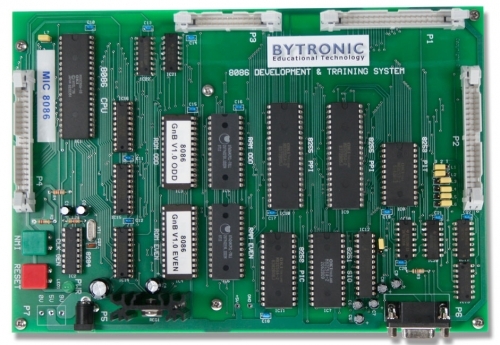 Designed as a general purpose unit it simplifies the teaching of the 8086 CPU and its commonly used peripherals. Suitable for use at all levels, from simple programs flashing an LED to use as a controller in complex projects. The MIC-8086 is used as a development system for 8086 Assembler Code programs, the EPROM based monitor providing a user interface to a PC through its serial port. Assembler code programs for the 8086 are constructed on the PC and downloaded from the host in Intel Hex format. Programs can be entered into the integral WINDOWS based, LINE-by-LINE assembler, disassembled and easily debugged with the monitoring facilities. LINE assembled programs can also be saved and re-loaded when required.